community room. Together the combined facility welcomed more than 97,000 visits in its first three months. 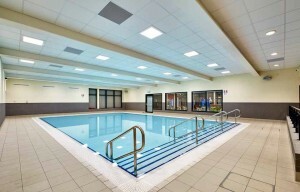 The consortium that designed and built the new leisure centre included Pellikaan Construction and Roberts Limbrick architects, in a project led by leisure operators, Places for People Leisure. Gold medal winning Olympian and BBC presenter Colin Jackson CBE officially opened the centre that has regularly been attracting 5,000 visitors weekly. Colin commented: “Sparkhill Pool and Fitness Centre is a real community hub and its fantastic to see a great facility such as this, where the whole community can come together and enjoy a more active and social lifestyle.